Religiously unaffiliated voters and Jewish voters were firmly in Obama’s corner in 2012 (70% and 69%, respectively). Compared with 2008, support for Obama ticked downward among both Jews and religiously unaffiliated voters in the exit polls, though these declines appear not to be statistically significant. Both of these groups have long been strongly supportive of Democratic candidates in presidential elections. Black Protestants also voted overwhelmingly for Obama (95%). Compared with religiously unaffiliated and Jewish voters on the left and white evangelicals and Mormons on the right, Catholics and white mainline Protestants were more evenly divided. Among white mainline Protestants in the exit poll, 54% voted for Romney, while 44% supported Obama. This is virtually identical to the 2008 election, when 55% of white mainline Protestants voted for McCain and 44% backed Obama. 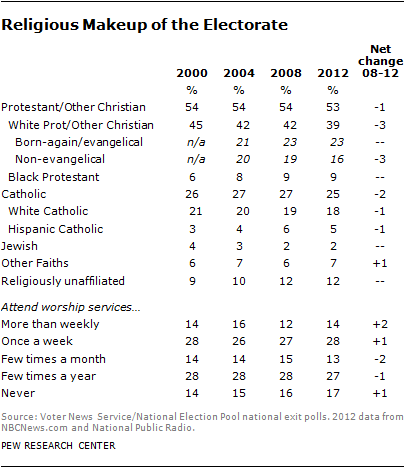 White Catholics, by contrast, swung strongly in the Republican direction relative to 2008. 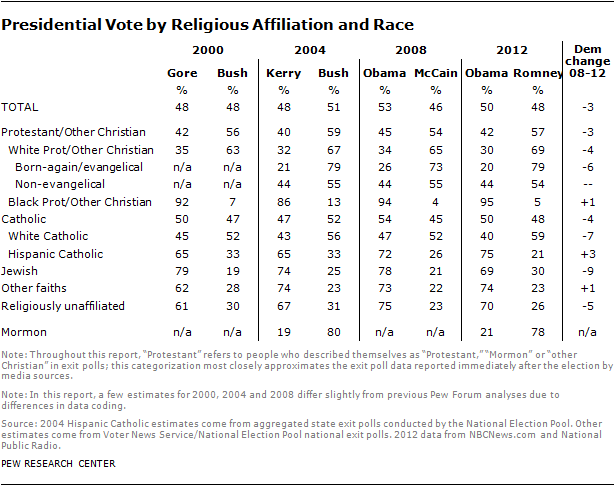 Nearly six-in-ten white Catholics (59%) voted for Romney, up from 52% who voted for McCain in 2008. Three-quarters of Hispanic Catholics voted for Obama, and Catholics as a whole were evenly divided in 2012 (50% voted for Obama, while 48% backed Romney). As in other recent elections, those who attend religious services most often exhibited the strongest support for the Republican presidential candidate. Nearly six-in-ten voters who say they attend religious services at least once a week voted for Romney (59%), while 39% backed Obama. 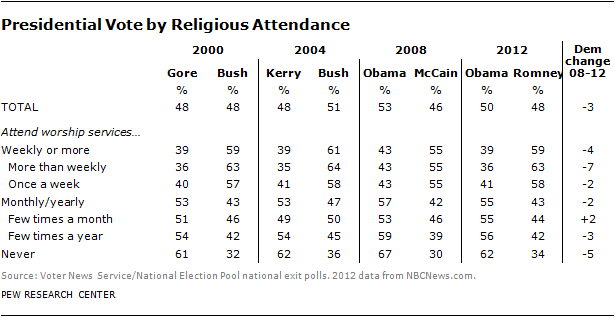 Romney received as much support from weekly churchgoers as other Republican candidates have in recent elections. Those who say they never attend religious services were again among the strongest Democratic supporters in the presidential election. More than six-in-ten voters who say they never attend religious services voted for Obama (62%). Voters who say they attend religious services a few times a month or a few times a year also supported Obama over Romney by a 55% to 43% margin. The religious composition of the 2012 electorate resembled recent elections, though there are signs that both the white Protestant and white Catholic share of the electorate are gradually declining over the long term. Slightly more than half of 2012 voters describe themselves as Protestants (53%), compared with 54% in each of the three previous elections. Roughly four-in-ten voters were white Protestants in 2012 (39%); by comparison, 42% of 2004 and 2008 voters were white Protestants, as were 45% of 2000 voters. The decline in white Protestants’ share of the electorate is most evident among non-evangelicals, whose share of the electorate has declined slightly from 20% in 2004 to 16% in 2012. White evangelical Protestants constituted 23% of the 2012 electorate, compared with 23% in 2008 and 21% in 2004. One-quarter of 2012 voters were Catholics, including 18% who were white Catholics. By comparison, white Catholics constituted 21% of the electorate in 2000, 20% of voters in 2004 and 19% of the electorate in 2008. Jews accounted for 2% of the 2012 electorate, and Muslims and members of other non-Christian faiths together accounted for 7% of the electorate. The religiously unaffiliated made up 12% of 2012 voters; the religiously unaffiliated share of the electorate is unchanged from 2008, even though the religiously unaffiliated share of the adult population has grown significantly over this period. For more election-related analysis from the Pew Research Center, see “Changing Face of America Helps Assure Obama Victory,” Pew Research Center for the People & the Press, Nov. 7, 2012, “Latino Voters in the 2012 Election,” Pew Hispanic Center, Nov. 7, 2012 and “A Milestone En Route to a Majority Minority Nation,” Pew Social & Demographic Trends, Nov. 7, 2012.